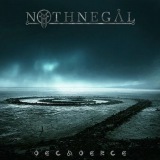 Melodeath from the Maldives, Nothnegal play a complex, layered form of melodeath that focuses largely on chugging guitars and backing keyboards to drives its particular style of the genre onwards. Featuring ex-Chimaira drummer Kevin Talley and ex-Kalmah keyboardist Marco Sneck, there's a good amount of traditional and modern metal styles mixed up in Decadence, even if the results aren't always quite as good as the promise. There's a progressive feel to this album, hints of Meshuggahsms in the groovy guitarwork often coming to naught, as enjoyable and technically proficient as the guitarists are - the soloing in Claymore a good example, as is the generally tight and technical riffage. When Nothnegal kick into gear, metallic excellence ensues, Armageddon sure to get your neck working. Where Decadence stumbles is in the songwriting, songs feeling bland and characterless, as excellent as the ingredients are. As you'd expect from the namedropping in the first paragraph, both drums and keyboards on Decadence are superb, especially Sneck's keyboards, which come into their own in the likes of Janus. Yet in terms of putting the skills of these and the guitarists together into a satisfying unity, Nothnegal's inexperience shows. Decadence is their debut, and you can tell. Most perplexing was the decision to limit clean vocals to the last two songs only, using slightly bland throaty growls everywhere else. It's a shame, because vocalist Avo has a good voice, and Sins Of Our Creations and epic finale Singularity show a wider side of Nothnegal's skills - both would more than appeal to casual power metallers. Being fair to the band, and to Season Of Mist, there is very clearly talent here, and another album will show the band's skills off better. For the moment, this is a promise unfufilled, an album to enjoy but not to love; remember the name, I expect impressive things come Nothnegal's next studio outing.